Met the RD Trent and thanked him for accommodating me in the race. Humorous guy and sounded as funny as his emails. There were lots of other folks in funny costumes surrounding the theme "flying Monkey". After a brief overview about the race course, the race started on time and the flying monkeys flew. What a beautiful race course. It was gorgeous. The first 5 mile was fun and then began the elevation. My assumption about the course went wrong, elevation so steep at some point that everyone started walking but the volunteers were just amazing. 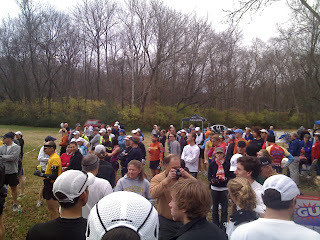 Aid stations were loaded with food, GU, Water, Gatorade etc etc. They were cheering us all the way. Some of the volunteers got their kids to watch and support the flying monkeys. It was so good to look at their cheerful face clapping and encouraging us to run. 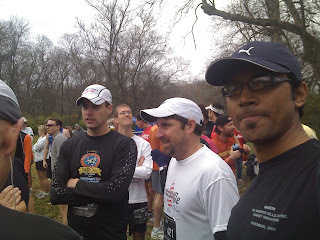 I wanted to finish the race in 4:30 but that seemed to be impossible when I hit the 19th mile at that time. That's another 7 miles to the finish line. The guy who won the race is a machine. It wasn't even a flat course yet he completed it in under 2:30. I didn't really train myself for this elevation. My shin splint was crawling up and at the 22nd mile; I couldn't run a single step. I did some stretching and walked half a mile which felt a bit better. "Eye of the tiger" was playing loud at the 24th mile, a tempo song to complete the last couple of miles, Sweet. The flying monkey medal started appearing before my eyes. I was in pain. My legs were crying. C'mon Naresh, last 2 mile and the medal is yours. I could hear the band playing at the finish line by that time. There were lots of people and photographers cheering at the finish line, which felt very good. Pain just vanished for that one moment and there I crossed the finish line. In no time flying monkey medal was hanging on my neck. w00t. Second Marathon, COMPLETED. After post stretching exercise, picked up some pasta and chilled beer and relaxed for a while. One helluva race and lots of fun. Here’s my Race timing, 13th in my Age Group. Lesson learnt: Study the course especially if it’s a trail. Carbo loading and sound sleep the day before the race.